We have `` OHIGAN`` this week , My son's classmate's mother and I made ``OHAGI`` today. We have OHIGAN twice an year they are spring and autumn. The middle day of it we have national holidays, they're on 20th March and on 22th September this year so it is a week before and after 3days on the holidays. It comes from buddism custom but we have Japanese style Ohigan now, during the days we pray our forefather's graves. 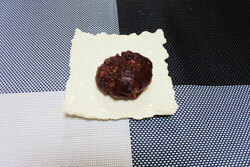 We offer OHAGI (BOTAMOCHI) to pray to forefather, Ohagi and Botamochi are mochi rice ball rapped with red sweet beans, it's really simple to make. Ohagi is a name of autumn ohigan offering and Botamochi is a name of spring it because the Ohagi means a autumn flower hagi (lespedeza) the Botamochi means a spring flower botan (paeonia suffruticosa). A big typhoon is approrching, be safe everyone! !